The University of St. Thomas Opus College of Business invites you to rise with us. With a vision to educate highly principled global leaders, we are the only private university in Minnesota accredited by AACSB International and are ranked in the top 25% of accredited business schools. Featuring the world’s largest business ethics faculty, an emphasis on leadership and decision-making is integrated throughout the curriculum. We offer undergraduate concentrations in 13 fields and master’s degrees in seven programs, including full- and part-time MBA programs. The school enrolls another 4,300 participants annually in executive-education classes. 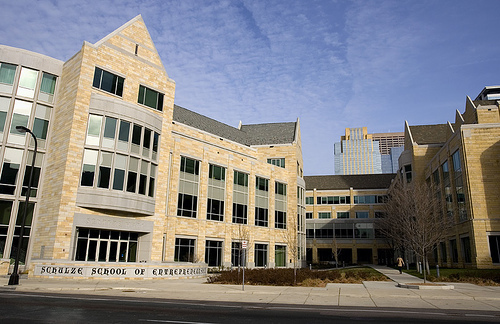 The college is also home to 13 research centers and institutes that enhance and inform policy and provide business resources to UST MBA students and the public. Member of National Black MBA and National Hispanic MBA organizations. Goal is for 33% of Full-time UST MBA students to represent minority communities. Graduate Assistantships for Second-Year Students: Each year, the Full-time UST MBA core faculty and various departments on campus select students to work roughly ten hours per week. Selected students must be in good academic standing and will exemplify academic excellence, commitment to the Full-time UST MBA program and strong peer relationships within their cohort. Want more info about University of St. Thomas, Opus College of Business Full Time MBA? Get free advice from education experts and Noodle community members. What’s required to apply for a full time MBA at the University of St. Thomas?